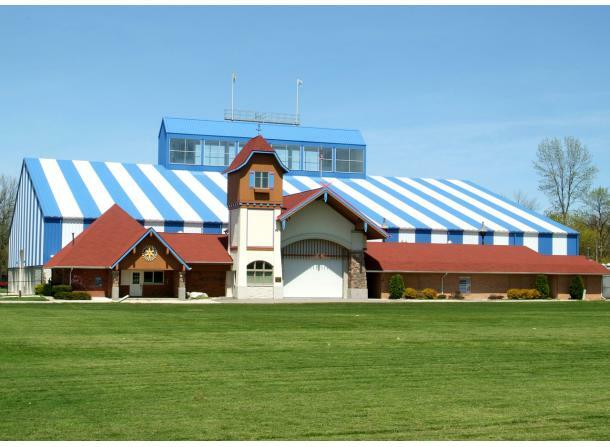 Kern Pavilion is a large, clear span structure, that provides a flexible space for a variety of large events including festivals, concerts, trade shows, and many other activities. Rental rates vary by days of the week, type of event, length of event, etc. Please contact Kellie Nichols for availability and pricing. Description: Located at Frankenmuth’s Heritage Park, approx. 500’ from the Bavarian Inn Lodge. Height: At walls: 24'; in middle: 47'. Access: Large overhead doors on three sides. Floor: Concrete. Electrical: Over 1000 Amps (120/208v 3 phase). Lighting: Numerous options, including dimmers. Heat/Ventilation: Auxiliary heat available. No air conditioning. Various ventilation options. Internet: Various options including high speed & wireless. Food Service: Caterer of choice- several locations for caterer set-up. Tables/Chairs: Available for rent from local civic group or through any outside vendor.